Research highlights that when students with disabilities have the capacity to be better self-advocates and act in a self-determined manner, they experience significant positive educational and life benefits. Unfortunately, incorporating these skills and capacities isn’t the norm with education for students with disabilities. Although all school professionals play a role in supporting student development of self-advocacy skills and self-determination, the school counseling field embraces these ideas and incorporates them into its best practices. In particular, ASCA’s Mindsets & Behaviors are centered on three domains – academic, career and social/emotional – that rely on students building a foundation of self-determination and self-advocacy skills. Learn how you can translate this aspiration and potential, helping develop students’ self-advocacy and self-determination into a reality. Download accompanying handout. Discuss ideas and research behind self-advocacy, self-determination and personalized learning. 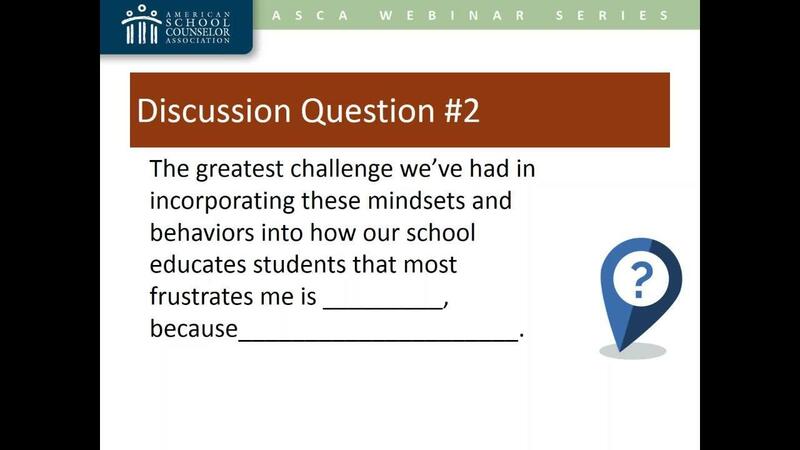 Describe the connection between these ideas and the ASCA Mindsets & Behaviors for Student Success. Identify the role of school counselors in effectively facilitating these skills and capacities to benefit both students with and without disabilities.